Husqvarna zero-turn mowers offer industry-best ergonomics that reduce operator fatigue without sacrificing the performance and durability that professionals need to get their jobs done right. The centerpiece of the zero-turn line’s ergonomic design is the premium suspension seat, which features deep cushions and elastomeric vibration control (EVC) to provide unsurpassed comfort during long working hours. The seat is fully suspended above the frame of the mower to reduce vibrations on the operator, which ultimately provides a smoother ride even over rough terrain. 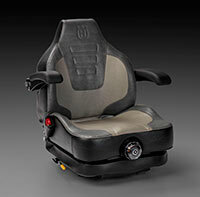 The premium suspension seat comes standard with all Husqvarna PZ zero-turn mowers.